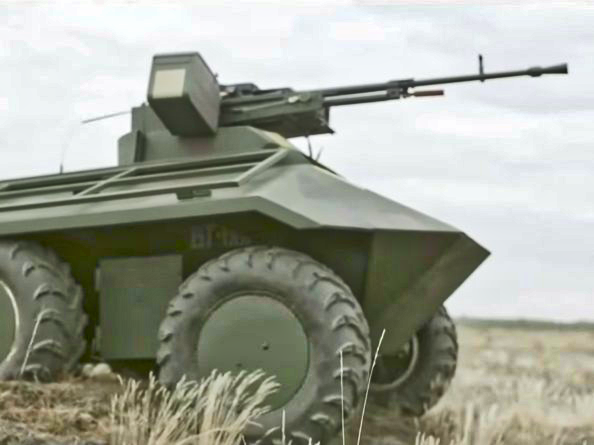 KIEV, Ukraine -- A new fighting robot called the Phantom might be deployed on the battlefield in eastern Ukraine next year, according to Defense One. It runs on a 30 kilowatt hybrid engine that can hit speeds of up to 37 mph, and it can cover a maximum distance of about 81 miles, Ukroboronprom said. It is even capable of evacuating wounded soldiers from the field. The Phantom also has a backup microwave-communication link that allows it to function even if its receiver is jammed or hacked, Defense One reported. This feature was specifically designed to counter Russian electronic-warfare attacks that have plagued Ukrainian forces, especially in the early days of the war. The US is developing fighting robots as well, and Russia already "has a wide array of ground bots" but has not deployed them to the Donbass, according to Defense One. "We came [to the AUSA in DC] to show our expertise and potential — to show that we can be partners," Roksolana Sheiko, director of communications policy for UkrOboronProm, told Foreign Policy. In late July, the Pentagon said it was considering arming Kiev with lethal weapons, including the Javelin antitank missile, to deter Russia. In late August, Defense Secretary Jim Mattis announced during his visit to Kiev that the US had just approved supplying Ukraine with $175 million in military equipment.